Cape Town — Malawian President Joyce Banda has decided to cut her salary by 30% in support of her government's austerity measures. Her decision reportedly takes her back to earning the salary she did while vice president. But she says this is the best strategy for the country's weak economy. "When I took over, the economy had almost collapsed. 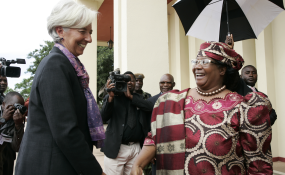 I told Malawians we needed to pass through difficult times," Ms Banda said in an interview with Business Day Live. Banda, Africa's second female President after Liberia's Ellen Johnson Sirleaf, came to power in April after the unexpected death of President Bingu wa Mutharika. Banda told Pana Press that she will not force her cabinet to follow suit, saying the final decision is up to them. The president has also firmly stood by her decision of not boarding the controversial presidential jet, which will be sold in two weeks. This was welcomed by donors as a move in the right direction in the current economic climate. Copyright © 2012 allAfrica.com. All rights reserved. Distributed by AllAfrica Global Media (allAfrica.com). To contact the copyright holder directly for corrections — or for permission to republish or make other authorized use of this material, click here.